HomeFull Electric Bariatric Hospital Bed 42"
This full electric hospital bed frame can be used with alternating pressure mattress systems or pressure relief mattresses. This hospital bed frame is designed to support a 42" width mattress and has a quiet and smooth operation. The heavy duty steel frame is durable and supports up to 600 lbs. It offers a larger sleep surface than most standard hospital bed frames. This bariatric hospital bed comes with a powered hand control that provides multiple positions for the patient. Remote control adjusts the head, feet and height of bed. Designed for use with low air loss, alternating pressure, and or foam pressure prevention mattresses. Add hand rails or a gel pressure relief mattress. Optional: Gel Mattress heals up to stage 2 bed sores and can be used with an alternating pressure mattress system 42" Width X 78" Length X 3" Depth Easy to assemble, no tools required. Includes free delivery. This full electric hospital bed frame can be used with alternating pressure mattress systems or pressure relief mattresses. This hospital bed frame is designed to support a 42" width mattress and has a quiet and smooth operation. The heavy duty steel frame is durable and supports up to 600 lbs. It offers a larger sleep surface than most standard hospital bed frames. This bariatric hospital bed comes with a powered hand control that provides multiple positions for the patient. Remote control adjusts the head, feet and height of bed. Designed for use with low air loss, alternating pressure, and or foam pressure prevention mattresses. Add hand rails or a gel pressure relief mattress. Easy to assemble, no tools required. Includes free delivery. Carton Shipping Weight	276 lbs. 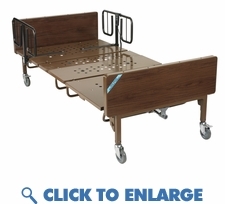 Product Name: Full Electric Bariatric Hospital Bed 42"